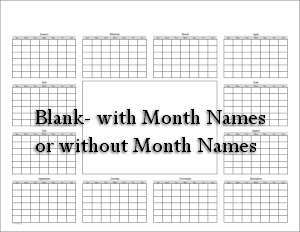 The printable blank calendars on this page include the entire year and prints on one sheet of paper. There are dated versions of the calendars on shown this page. To use the dated calendars, follow the " See Also" links. See Also: There are two dated calendars that resemble this one. See Blue Calendars and Light Blue Calendars. 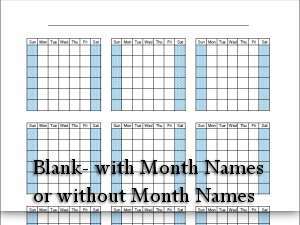 If you need holiday dates or answers for next year go to this page, Data for Blank Calendars.